I try so hard to do everything just right. She is my first. Obviously I want to do everything the best for her. So I have been teaching her to read and write and memorize...I feel with some pretty darn good success. Well today I was humbled. 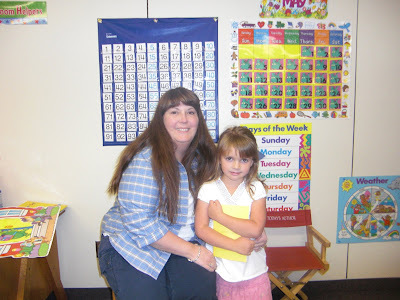 Today she had her kindergarten assessment. She was beyond excited. All morning long she begged me to prepare. 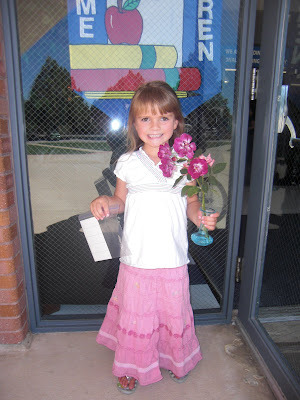 She practiced writing her name, insisted on picking roses from the yard, finding the perfect vase, preparing a gift bag of stickers for her teacher (which consisted of a baggy full of 1"x 3" self adhesive labels and about 15 sticker rhinestones, as seen in the picture above, she was sure her teacher would think it would be a wonderful activity to decorate the labels and make beautiful sparkly stickers) and asked me about a hundred times if it was 2 pm yet. 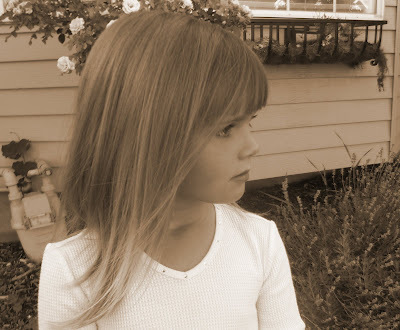 As the assessment began, I quietly listened and my heart swelled with pride as she spouted off perfect answers to each of her teacher's queries. But she was spouting. I became a bit abashed by her extreme confidence. Admittedly bordering on haughtiness. This was a completely different Ellery than I anticipated. I was prepared for demure and shy. Things went from uncomfortable to astounded for me as her teacher started testing reading skills. Mrs. S... pointing to the word "bat" ... "Ellery what does this say?" Ellery...glancing for a fraction of a second resolutely responds..."Dog"
Mrs. S...."Are you sure...do you want to sound it out?" Ellery..."No. That word is dog." Mrs S...pointing to the word "play"..."What word is this Ellery?" Ellery...glancing for possibly a second and announcing decidedly..."Doll"
Ellery..."No. That word says doll." I was dumbfounded. She was supremely confident and proud of herself. Obviously she felt it would be demeaning in some way to sound out the words...never imagining for a moment she possibly had said the incorrect word. I have no clue what was going through her head. Ellery then proceeded to march around the room, as if she owned the place. Pretty much I was stunned...even a little embarrassed. This should be quite an interesting year. Brace yourself Mom.